BBC NEWS | Business | Smoothies: the new coffee wars? Smoothies: the new coffee wars? In the 80s, fast-food burger joints flooded UK town centres. By the 90s, coffee shops took their place on every street corner. But now that the noughties are well established, the new fast food fight is on a rather healthier battlefield. Warnings about obesity and increased awareness of the importance of eating five fruit a day have fuelled a surge in healthy eating. 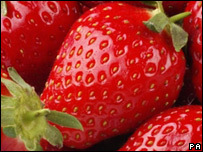 The UK smoothie market is worth £100m and doubling yearly. 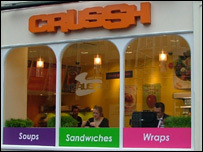 London's Crussh, which opened its 15th branch just off Oxford Street in October, is the UK's biggest smoothie chain. The firm, now eight years old, expects to turn over more than £5m this year. Boost Juice Bars, which has nearly 200 outlets stretching from Australia to Kuwait, is set to enter the market, with plans to open bars in Manchester, Oxford and Nottingham by March 2007. The firm recently signed a deal with former Millie's Cookies owner Richard O'Sullivan to bring the brand to the UK. And although the world's largest smoothie chain, US-based Jamba Juice, has yet to enter the UK market, chains such as Love Juice and Fruit Boost are also expanding. In a country where for a decade or more the cappuccino has ruled supreme, many people are now seeking a healthier alternative. Thus the race to enter the smoothie business. "I'm not in the slightest bit worried about coffee shops," says Boost's Mr O'Sullivan. "The potential in the well-being sector is enormous." Crussh's head of marketing Jo Maer agrees. "We offer an environment where people can relax and leave feeling energised," she says. Apparently, smoothies taste good too. "In the past, all health foods tasted awful. Now we can offer fantastic tasting products that are good for you," says Mr O'Sullivan. Another key benefit of smoothies is their convenience. The bars are proving popular among those who demand nutrition-on-the-go. "Convenience once meant processed food, but now I can get a smoothie freshly made in 90 seconds," Ms Maer says. There may, however, be seasonal issues. Smoothies are a refreshing choice in summer - but what happens to sales when winter comes? Ms Maer admits the winter market is "difficult". As alternatives, Crussh includes in its range soup, honey porridge - and coffee. "We also offer products with healthy twists like sandwiches on reduced fat wholegrain bread," she says. For Mr O'Sullivan, the weather issue means that he believes smoothie bars will achieve their greatest success in shopping centres and airports. "It's very difficult to sell smoothies in winter," he says. "That's why we'll sell them in protected environments." In stark contrast to Crussh, though, Boost will sell nothing but juice-based drinks and smoothies. Instead of coffee, they will offer "hotties" such as Banana Berry Hot Chocolate. "We focus on doing one thing," Mr O'Sullivan says. "We offer a meal in a cup as a replacement to fast-food. You can't be excellent at everything." So as competition intensifies, who are the likely victors in the smoothie wars? Mr O'Sullivan thinks no winner will emerge in the UK market soon, but is confident about Boost's eventual success. After selling 120 Millie's stores to Compass in 2003, Mr O'Sullivan says he could have "put his feet up". It was his daughter who stumbled across Boost on her gap year in Australia. She phoned him to tell him: "Dad, this is you." He got straight on a plane to Australia. "Boost was something that inspired me," he says. "I love their first-in-class mentality." But at the moment, Mr O'Sullivan thinks it is the landlords who are profiting. "Currently 20 juice operators compete for the same sites. Landlords are the only winners," he says. "We have the finance and ability to open 20 smoothie bars without breaking a sweat. But it's about ensuring we get the right sites in the right places. That said, he remains confident. "It's a marathon," he says. "I'm not in it for a sprint. Boost will win - it's just a matter of time." With so many new entrants, Ms Maer believes it is an "exciting time" to be in the smoothie market, but is sure there is room for more than one big player. Still, Crussh has grand plans to take the brand beyond the capital to every British high street. The firm intends to expand to major UK cities within the next financial year and aims to open 150 stores within 10 years, the idea being to make sure there is a branch within walking distance for most people. The challenge, Ms Mayer says, will be to keep the local feel of the bars alive as the chain expands, since customers value the fact that they are not a "corporate giant". "The aim of Crussh is to make healthy lifestyle accessible," she says, "not to make millions." It is far too early to tell which firms will survive the smoothie wars and thrive in the long term. For the moment, however, the evolution of the smoothie - from hippie drinks to hip on the High Street - seems unstoppable.